If you are a Silver Sponsor or above you earninvitations to a special sponsor event, Sponsor Night Lights on Friday, October 11th. It’s aspectacular invitation-only night time airshow with model aircraft, hot air balloons, and Manfred Radius’ glider lighting up the sky. Our STEM program for Culpeper County Public School fifth graders was expanded to homeschool families this past year. The program, a partnership between the Air Fest and CCPS, introduced students to hands-on learning on subjects they have been talking about in classes. Over 600 children visited our exhibits last year. 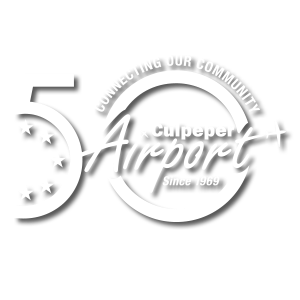 The Culpeper Airport is celebrating 50 years of connecting our community this year. Culpeper Regional Airport was dedicated onNovember 15th, 1969. Stay tuned for promotions and events throughout the year commemorating this historic milestone. Our goal is to honor the contributions of historic military aircraft, which helped to secure our nation’s freedom. The Culpeper Air Fest features the ONLY civilian-owned-and-operated Harrier jump jet, which can take oﬀ and land vertically, yet ﬂy at near supersonic speeds. The Air Fest is a celebration of our aviation heritage and is a fun, family-friendly, community-oriented event. The show is locally produced, free to the public and draws top performers from around the nation oﬀering something for everyone. 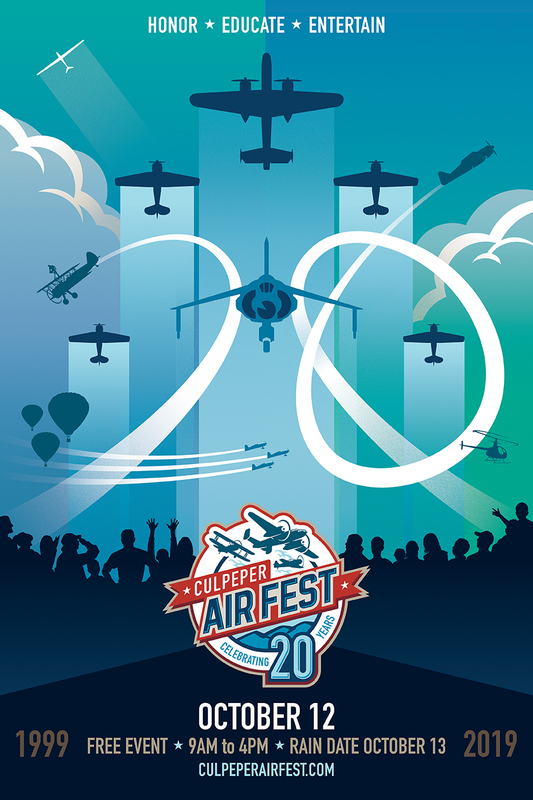 The Culpeper Air Fest is held at the Culpeper Regional Airport. Plan your trip to this year’s event with our handy FAQs section. We almost have all of our acts booked for this year. Stay in touch with us via email by signing up for our E-newsletter or follow us on Facebook, Instagram, and Twitter @CulpeperAirFest for pics, videos and news. For the past several years the Potomac Flight has dazzled crowds in Culpeper and the Washington, DC area with its tribute to America’s fallen veterans. Dozens of warbirds flying in tight formation over our Nation’s majestic monuments is a fitting remembrance of the sacrifices our service members have made to our country. We are so very proud to produce it for you! As the Potomac Flight team is also deeply involved in the planning and production of the Arsenal of Democracy flyover, we are going to skip the Potomac Flight in 2019 and resume next year in 2020. Please stay tuned for updates and we look forward to performing for you again in 2020!